A continuing series of posts from inside Chevron’s former oil concession in Ecuador ground zero of the landmark Aguinda v. Chevron lawsuit. After bearing witness to the gusher that irreversibly changed the future of Ecuador, its rainforests and its inhabitants, we continue on the toxic trail of Chevron’s legacy and arrive at Lago Agrio #2. We pull into the clearing around the now defunct well. Seems innocent enough. No machinery, no drilling platform, no rig. We get out of the car and walk about 100 meters into some of the degraded surrounding forest. Our guide from the Frente pulls out an auger, and leads us to an area of relative clearing in what is normally dense tropical rainforest. There is visible grass and small plants, but he tells us that here is where the oil is. Hard to believe, but he starts digging down using the auger and within seconds, he pulls up a mix of red clay soil bespectacled with shiny black flecks. We lean in to take a closer look and get a big whiff of what smells distinctly like high-octane gasoline. It’s actually a fairly familiar smell to me, being one who always tries to cram an extra 1/4 gallon into his tank and ends up with fingers and flip flops that reek for a week. We dig down a little deeper, and can hear the sloshing sounds of water and mud. The auger comes up almost entirely black. This time we needn’t lean in, for the fumes are nauseating from several feet away. But we do anyway, and the burn is felt up through my nasal passage, stinging the sinuses, and probably taking a few brain cells with it too. It starts to make sense why there’s nothing with deep roots growing around here—because it wouldn’t live long soaking up this toxic ‘Texas Tea’. This is one of Chevron’s “remediated” sites, and a cursory glance from afar might lead one to think that everything is fine here-- a deceptive and deadly mistake if you happen to put your water well next to one of these “clean” pits. These pits are in essence the crux of the lawsuit. As I talked about in my first post, Texaco (now Chevron) designed, built, and operated a cheap and contaminating system of oil production—in the middle of one of the most biodiverse places on the planet, where local people live and die by the quality of available fresh water. 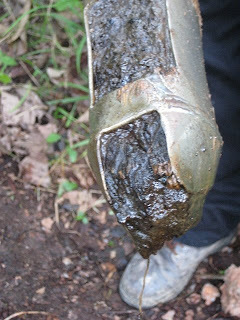 Instead of re-injecting the toxic brew of drilling muds, chemical cleaning solvents, produced waters, and leftover crude, Texaco dumped this waste into unlined pits. Each well (Texaco built over 300) usually had about 3 pits, and they were “strategically” placed to drain into nearby streams. The pits had no reinforcement, and would often breach or overflow with heavy rains (as are common in the rainforest). But, as we’re seeing at Lago Agrio #2, this doesn’t look anything like a clean up. Turns out, Texaco only carried out a “clean up” at 16% of the approximately 916 pits, and didn’t lift a finger at the other 84% of them. In other words, Texaco “cleaned up” 146, and left 769. Even worse, is that those 146 pits aren’t really clean. According to samples taken by the independent, court appointed expert at 54 sites claimed to be remediated by Texaco, 45 have illegal levels of Total Petroleum Hydrocarbons (TPHs). A Lago #2, TPH levels were 4,777 ppm (parts per million), or 4.7 times over the legal limit in Ecuador, and much higher than the 100 ppm threshold in many U.S. states. One “remediated” pit has TPH levels at 206,512 ppm, or 206 times the legal limit. So what happened? Local people say that Texaco merely pushed dirt over the pits. What is clear is that contaminated soils were never removed. Texaco likes to say it used an EPA test to certify that the pits had truly been cleaned. However, they used the wrong test to rig the results in their favor. Chevron now hides behind this junk science and claims the pits are clean. Tragically (or criminally), this has meant that campesinos have built houses above the pits believing the pits were clean, only to find crude oozing from the soil underneath their homes, or their groundwater wells reeking of petroleum. And here’s another catch---how do you conduct a clean up when there isn’t a complete inventory of all the contaminated sites you left? The recent 60 Minutes expose on the case reveals that, by the company’s own admission, it “never kept a master inventory list” of all toxic sites. During judicial inspections of the site and those visits carried out by the court appointed expert, it became clear that there are pits which were dug, abandoned and never inventoried by Texaco. Satellite images from Ecuador’s Military Geographic Institute reveal hidden pits, which can been clearly seen as dark stains on the canopy floor. So Texaco’s crude clean up sought to clean up only a fraction of the waste that was left, and even that was ineffective at best. If this is the trial of the century, then the Texaco “clean up” was the environmental fraud of the century. In our next post from the trial over Chevron’s toxic legacy, we speak to local affected indigenous communities and campesinos, and visit one of the 769 pits abandoned by Texaco. Kevin Koenig is Amazon Watch's Northern Amazon Program Coordinator. Kevin lives and works Ecuador and has spent extensive time on the ground with affected communities and partner NGOs. Prior to joining Amazon Watch, Kevin worked as the Ecuador researcher/organizer with the Rainforest Action Network as part of the Beyond Oil Campaign. At that time, he lived and worked in Ecuador for nearly four years, collaborating with indigenous and environmental NGOs on oil and gas issues. A Truth No Chevron Public Relations Can Hide.